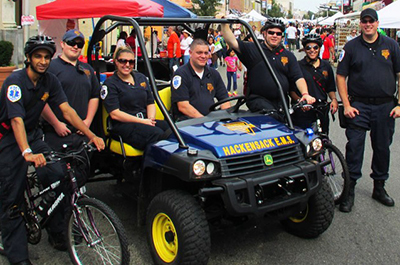 Community | Hackensack Volunteer Ambulance Corps, Inc.
Hackensack Volunteer Ambulance Corps provides EMS staging and support at events across Bergen County. Personnel and equipment are provided per EMS branch command requirements. Events range from July 4 festivals and high school sports to major sporting events like Super Bowl XLVIII and the World Cup. In addition to ambulances, the Corps has cooling stations, triage tents, a Gator and a bike team for rapid responses in crowded areas. 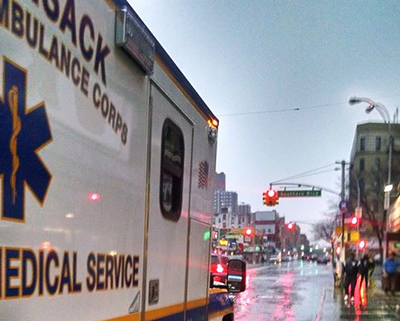 The Hackensack Volunteer Ambulance Corps provides residents with a free File of Life. This form, which can be attached to a refrigerator, can contain useful medical information such as medications and allergies, allowing faster and better patient care when EMS is on scene. If you have an elderly relative living in town, we recommend helping them complete a File of Life and attaching it to their refrigerator. If you would like us to send you a File of Life free of charge, please contact us. The Corps conducts vehicle extrication drills with the Hackensack Fire Department to practice skills in a real life setting. The drills are conducted outside using donated cars. 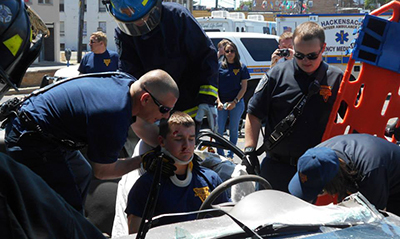 The public is welcome to observe a drill, which includes patient extrication and the use of the jaws of life. The Hackensack Volunteer Ambulance Corps extends its education programs for students and other groups. 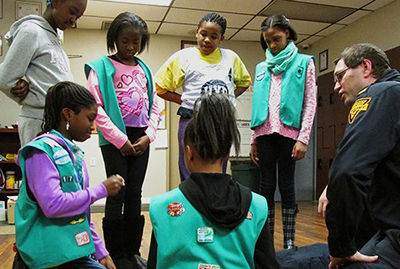 We regularly provide tours and first aid training to boy scout and girl scout troops. If your group would like to arrange a tour or program, please contact us. The Corps hosts blood drives in collaboration with Community Blood Services and other local organizations. If your group is interested in holding a blood drive at our headquarters, please contact us. The Hackensack Volunteer Ambulance Corps recognizes defibrillation as a key element in saving the lives of people struck with sudden cardiac arrest. Both the American Heart Association and the Red Cross publish that for each minute defibrillation is delayed, the chance of survival is reduced approximately 10%. 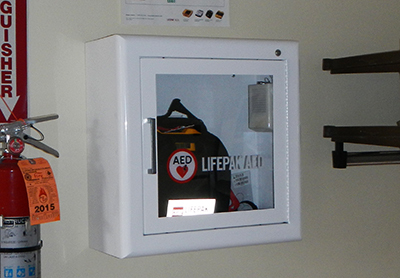 In an attempt to boost awareness and facilitate lay rescuers’ ability to make a lifesaving difference, we are posting a list of locations for Public Access Defibrillators (PADs) and/or Automated External Defibrillators (AEDs). The list is maintained here and on the City of Hackensack’s website. A representative of the Hackensack Volunteer Ambulance Corps will inspect the devices each February, AHA’s Heart Month. Batteries deplete and pads expire. This list has been provided to MICCOM EMS dispatch, Hackensack Police dispatch, and Hackensack Fire dispatch. The 9-1-1 operator will know if a PAD or AED is available at the incident location if the caller is not familiar with the area. If your business, office, or other location has a PAD or AED not listed here, please contact us to have your device included in this initiative. For more information on AEDs and CPR please visit the American Heart Association’s and/or the Red Cross’ website. The Hackensack Volunteer Ambulance Corps Bike Team provides on location EMS standby for the Pope’s visit to Philadelphia, PA.
Hackensack Volunteer Ambulance Corps assists the New Jersey Sports and Exposition Authority with Electric Daisy Carnival, providing two ambulances and crew dedicated to the event. Hackensack Volunteer Ambulance Corps responded to a mutual aid request by FDNY EMS to provide emergency medical service coverage for Bronx neighborhoods during a blizzard. Seattle Seahawks defeated the Denver Broncos 43–8 at Super Bowl XLVIII, held at MetLife Stadium, Meadowlands Sports Complex in East Rutherford, New Jersey. Hackensack Volunteer Ambulance Corps provided on-location EMS coverage of the event. Hackensack Volunteer Ambulance Corps, working in coordination with Hackensack Police, Bergen County Police, Bergen County SWAT, Bergen County Sherriff, NJ State Police, and US Marshals, provided standby assistance when an escaped inmate who had barricaded himself in an apartment on Polifly Road fired as many as 10 shots at US Marshals and HPD officers. Later in the month the Corps responded to a mutual aid request by FDNY EMS and provided 12 hours of emergency medical service, covering the Bedford/Stuyvesant and Crown Heights neighborhoods of Brooklyn, NY responding to 9-1-1 calls. Hackensack Volunteer Ambulance Corps established EMS branch command at the collapse of the parking garage at 310 Prospect Avenue, and assisted in the evacuation of residents. Hackensack Volunteer Ambulance Corps was dispatched to Weehawken to assist in the treatment and transportation of passengers of US Airways flight 1549, which successfully landed in the Hudson River six minutes after takeoff from LaGuardia Airport. Hackensack Volunteer Ambulance Corps was dispatched to the World Trade Center vicinity to assist in patient care as buildings and debris came down. 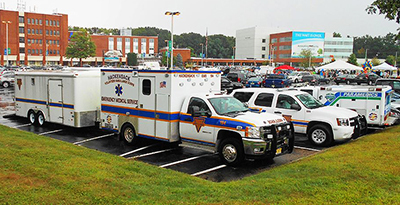 Hackensack Volunteer Ambulance Corps provided stand-by coverage for the seven FIFA World Cup matches held at Giants Stadium, East Rutherford, NJ, including the semifinal between Italy and Bulgaria. In February, 1974, the Hackensack Volunteer Ambulance Corps, in partnership with Hackensack Hospital and under the leadership of Dr. Michael Yablonski, launched the Heart Rescue Team. This was one of the first such programs in the country, and was the precursor to today’s paramedics. L-R: Unknown nurse, Dr. Michael Yablonski and Hackensack Volunteer EMT Emil Yanetti. The Heart Rescue Team was a project designed to quickly bring special hospital care to heart attack victims. The goal was to save lives by providing rapid, on-scene heart care. A car was donated by Hackensack Ford, and the program was sponsored by the Bergen County Heart Association. A doctor, nurse and volunteer EMT driver manned the vehicle and responded from the hospital emergency room to calls where the dispatcher screened a cardiac emergency. The care provided by the Heart Rescue Team included intravenous injections, heart monitoring and rhythm normalization. In 1981, the program was taken over by Hackensack Hospital and expanded across Bergen County, becoming the hospital’s mobile ICU unit.